When thinking about how the workforce is evolving, you need to think about what really matters to employees and how you can integrate technology in the workplace for the digital nomads of today. Corporate real estate, IT, and HR executives need to do a lot to meet those needs and achieve their HR goals. Cisco has the expertise needed to deliver high-quality mobility and collaboration solutions. We make business-critical communications possible in real time, across multiple channels. 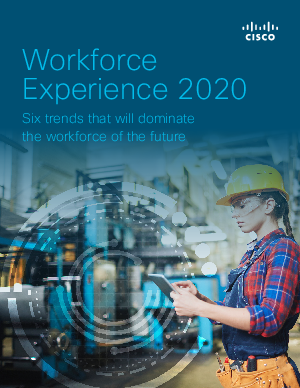 Cisco Workforce Experience offers are complete, enterprise-class solutions designed to scale smoothly and make your vision of the digital workspace a reality.